Hey folks. I'm Blair Shedd. 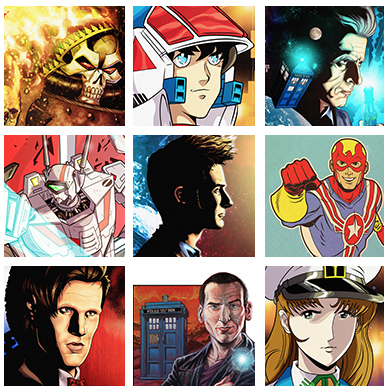 If you're a comic book fan and/or Whovian, you might know my work from Doctor Who from both IDW Publishing and Titan Publishing. I've also worked on comics such as Legends of Oz, The Guild, Ghostbusters, Assassin's Creed, Torchwood, Robotech, and more. Now you might be stopping by because of my recent webcomic debut, The Worlds Between Us. I'm freelance, which means, when I have a job, I get paid, and when I don't have a job, I don't (and in the case of my webcomic, I'm doing it on spec - for no pay promised, guaranteed, or possibly ever). So, like the story of the shark, I gotta keep moving or die (I know this isn't true of all sharks, but let me have this, okay?). But often I get asked things I'd like to help people with, from fans asking about how or why I drew a certain page or piece, aspiring artists asking about techniques or how to put together a portfolio, to people requesting video demonstrations. But these things stop me from working on jobs. So howabout this; you help me while I help you. For your monthly pledges, I'll give you things like behind-the-scenes look at art I'm working on now, peeks at secret things to come, hi-res looks at older pieces (and downloads), live shows with artwork you can have delivered to you in print, one-on-one art instruction, and more! I'll update once a week, so as not to flood your inbox, and catch you up on what's going on, what's new, and what's in it for you! Let's go for true symbiosis on this; help me and I'll be happy to help (and hopefully entertain) you! You'll get the satisfaction that comes from supporting an artist at a time where the arts are not the priority of those in power. By even this amount of support, you show that you care about the creatives in the world right now. • Strictly a reward tier for fans of the webcomic, The Worlds Between Us, your $2 a month goes towards helping me produce this free-to-read comic. I don't get paid to make it, nor do I charge anyone to read it, so all the expense and time of making it is on me. Help me keep this story going? I promise it'll be worth it. • As a supporter at this level, you get to see previews of webcomic pages in progress, and see finished pages days before they go live! • Each month, new Worlds supporters will get a shout out on the website! You get my undying gratitude (seriously), and I'll find you handsome and/or attractive for minutes on end (maybe). "Archived Arting"; see/download select full-resolution pieces of my artwork from my archives once a month. Read my patron-only musings on comics and related geekery. "Behind The Arting"; once-a-month hi-res art with the how and why of the piece, sometimes via pics and text, sometimes with a link to a video (before it's publicly available on YouTube). "Signed Stuff!" Once a month, get a random comic I worked on, or print of mine, signed (personalized if you wish), and sent to you at home! Once a month, you can request a digital color full-figure sketch, with a high res file sent to you (print it, wallpaper it, etc.). You can do this once, then then cancel after the 1st of the month for a single charge (or re-up under a lower tier. That'd be very nice of you). Once a month, you can request a traditionally drawn, color full-figure drawing, on 11"x17" comic board, sent to you at home! You can get this once, and then then cancel after the 1st of the month for a single charge (or re-up under a lower tier. That'd be very nice of you), or do it multiple times and get months of tutoring. FOR COMIC SHOPS AND FAN GROUPS! SHEDD HAPPENS - IN PERSON! I will FLY out to where ever you live (lower-48 only, please) and spend a day drawing for you , your customers, and/or friends/fam. I will give you a STACK of prints of mine. I will give you a STACK of comics I have worked on. I will sign whatever you want (save for human eyes). Great for comic shop signings, comic cons, big birthday parties, comic superfans, and Bill Gates. I'm lookin' at you, man. And of course, this can be a one-off pledge; pledge once, then cancel after the 1st of the month for a single charge (or re-up under a lower tier. That'd be very nice of you). In way of thanks, if we hit this goal, I'll put up a YouTube vid thanking you all by name (as long as you want your first name and last initial shared - or nickname), even if I have to read out 100 different names.